It’s not very easy to find out a suitable protective case for Google’s latest Nexus 4. Apparently Google has also noticed and released a bumper case for the Android phone.This is an official, bumper styled protective case designed for Nexus 4. 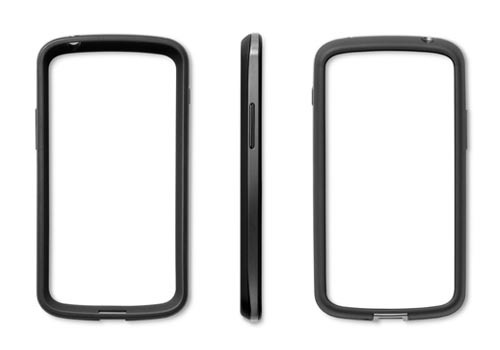 The Nexus 4 case measures 133.9 x 68.7 x 9.1mm and weights 20g.And as we can see from the image, the bumper case features ultra slim, lightweight and two-tone design, and due to removing of back cover, the Nexus 4 case doesn’t fully cover the gorgeous design of your Nexus 4. Of course, this kind of form-fitting is able to effectively protect the Android phone from bumps and scratches. Apart from that, all buttons and functions of your Nexus 4 are accessible via custom openings.The Google Nexus 4 bumper case is priced at $19.99 USD. If you’re interested, jump to Google Play for more details.